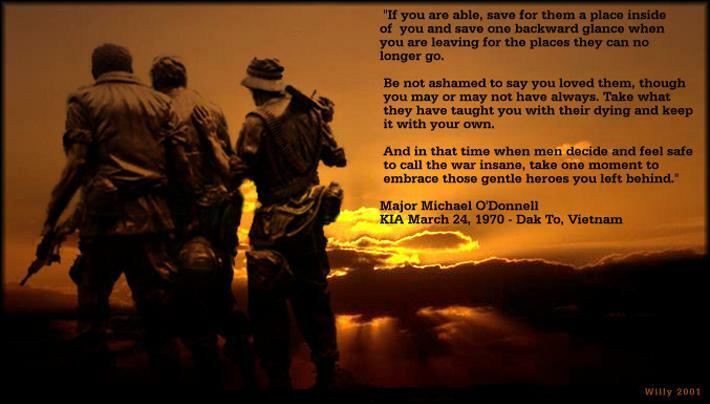 War is described by those who survived. it's left to them to reconstruct and analyze. from those who can not speak? simply because destiny for them was to die. or does in them lie the real final word? was made or are these words just best left unspoken. Into Bien Hoa, to Da Nang, Chu Lai then Duc Pho. Off the chopper in �Nam with a year to go. Standing there waiting with all my new gear. Just look in their eyes and see the fear. 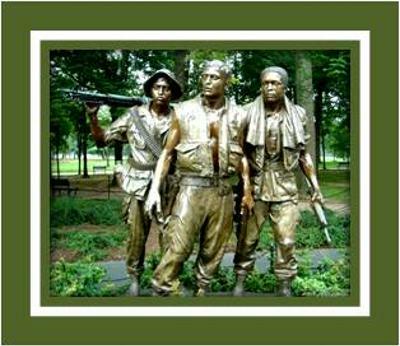 Over 500,000 men in �Nam and there stands one I know. We are far out in the mountains, but here no snow. Within hours he�s wounded, the NVA want control. Got to pay attention and know when to duck. Out in the field we wear no rank. Old timers are in charge, new guys walk the flank. Started walking Slack, then Point and Drag. Finished carrying radio, no jobs here to brag. The old guys say to be careful and do your job right. Always stay alert and be ready to fight. Learning about war with all these young men. Hoping to turn nineteen and go back home again. Packages and letters from home is how we get by. Tried to protect one another so no one would die. Saw and did things I will remember for life. We just wanted to get home to family, girlfriends or wife. Doc was killed in an ambush and lost Shorty to a mine. Our numbers are down but replacements they will find. Went to Da Nang after Christmas to see Bob Hope. My year is half over, only a few months to cope. Made lots of friends, but lost a few. War has a cost and they paid our dues. Ten months in the bush, then a rear job in Chu Lai. Great to be out of the field, but hard to say good-bye. Got a job at Division so can keep track of our men. When they go on stand-down I hope to see them again. My tour of duty is over, just one last good-bye. 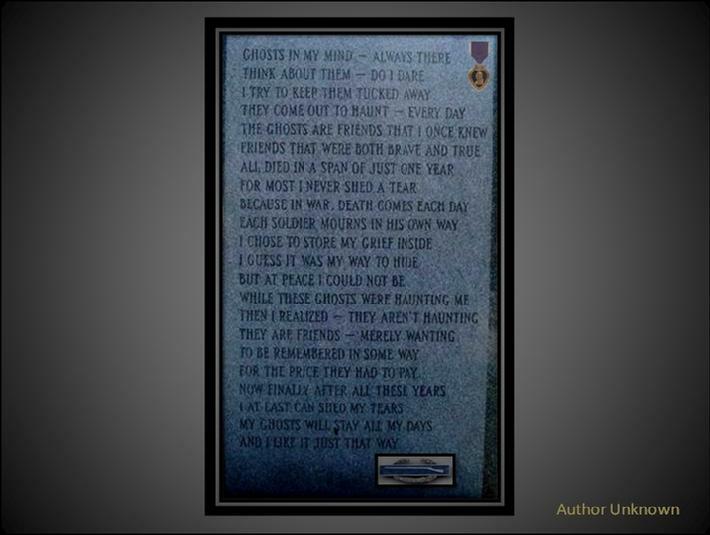 I�ll never forget �Nam and the young men that die. We met on September 30, 1970 on that fateful day. They had killed Doc and we wanted to make them pay. It was early in the morning after a sleepless night. We had movement all around us and were in for a fight. Pick up the mechs and packup the new LT said. But with no protection we all could be dead. We ignored his orders and did things the old way. After the past fighting we knew this was another bad day. We were just packing up when my mech went off. Gasping for air we could hear him cough. We grabbed our weapons and I lead us out. He was lying on the ground and let out a shout. He was trying to get to his AK so I gave it a kick. One of our guys grabbed it and it had a full clip. He had on a new uniform with a fancy belt. And with lots of gold teeth, he was an officer we felt. Lt called it in and Higher-up wanted to know. Just who he was and any kind of new info. So they called in a Dust-off to take him in. We didn�t save NVA lifes and hoped it would end. But we knew from his wounds he would soon be dead. Our Kit Carson Scout talked to him but nothing was said. It was my mech so his pack and stuff could be mine. But I wanted nothing of his that our guys would find. He had pictures of his wife and family just like us. Looking at all his stuff really made him cuss. He screamed one last time for the pictures he wanted back. I have thought of this man for almost 40 years. If fate had been different my family would have been in tears. Went to Louisiana in �78 to visit Doc�s grave. Got to meet his family and tell them he was brave. We talked about Nam and how he died. Looking at our pictures some of us cried. Told them as a medic Doc was second to none. As a friend on standdown he was a lot of fun. He patched us up and gave the wounded hope. Would the Dustoff get there in time, if not how to cope. I still see his body on a cable going up through the trees. We lost others but Doc�s death was the worst for me. Put flowers on his grave and then got on the way. Our families still exchange X-mas cards up to this day. Every time I see our flag I think of Doc. Between Luck and prayers I am still on the clock. The older I get the more I wonder. How did I survive, its hard to ponder. Was it all the training or just plain luck. When the bullets were flying and who got struck. Still go to the VA and meet with our Vietnam group. We talk about Nam and life and try to recoup. Steve is our leader and he trys to keep us on track. But some memories are hard and easy to hold back. I hope theres a place in heaven for such men. So we can tell old stories and meet old friends again. He is a man who once was a boy who loved to joke and play with his buddies. He is a man who once never believed in fear or death. He is a man who in one day learns that fear was real. He is a man who grew up very fast in a world of real life death and not the games you play as a kid when you play cops and robbers. He is a man who learns to cry when fear over took him. He is a man who learns to have faith in his buddies to help him survive in battle. He is a man who came home to hate and scorn from his friends. He is a man who now must live with the demons of his past. He is a man who must now live in a world of life, love and pain. He is a man who must deal with his wounds that he brought home from a war far from home. He is a man who must stand sometimes alone but always with the love and faith of his family and those who have been there also. What is a Nam Vet he is a man who still can stand tall in his heart and who still believes in his country. Guy L. Jones (110801) Co A & Hq,43d Signal Bn, Pleiku Vietnam 68-69. The other day I was walking into the local Wal-Mart store when I noticed an older man walking beside a younger man. The younger man was wearing army fatigues. I was curious so I stopped and asked, "Excuse me young man, but I was just wondering if you were in the service or are you just wearing fatigues?" The young man stated that he was really in the army and then his Dad added in a strong voice that was filled with pride, "This is my son and he has just returned from his second tour in Iraq." I told him how glad I was that he had returned home safely and then I said, "Young man, I would like to do something for you that no one outside of my family did for me when I returned home from serving in Viet Nam." "I'd be proud to welcome you home by shaking your hand if I might and say thank you for your service to our country," I said as I held out my hand. 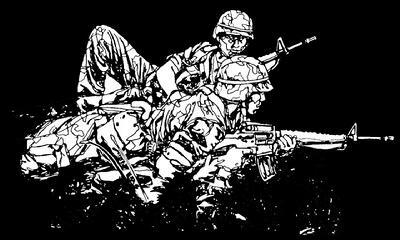 The young soldier and his Dad both stood a little taller as the young man stuck out his hand which I readily grasped and we just stood there, the three of us, with our right hands joined. We were three strangers drawn together by a common bond, we all understood, not needing to say anything more. 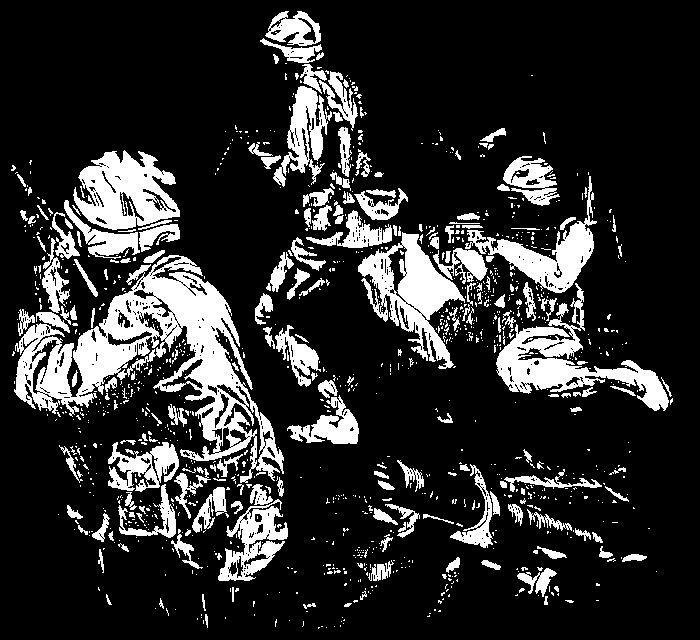 After nodding to each other, I started to break the grasp and walk away but the young soldier seemed to have something on his mind as he hesitated, and then he stopped me before I could move. He was quiet for a moment and then he looked me straight in the eye and then he ever so clearly uttered the words, "Thank you. . . and . . . Welcome Home". We then parted company as we went our separate ways. I finished buying the supplies I needed, walked on home, and oh yeah - I cried. We often forget to be thankful to those who serve our country, protect us from terrorism, and preserve our freedom. We have veterans living today that have served us in WWII, Korea, Viet Nam, and The Persian Gulf. We have those on active duty who are serving our country right now in Iraq as well as other places around the world. Today the average age of a WWII Veteran is 81; we are quickly losing them from the battlefield of life. They are now leaving us at the rate of 1500 per day. I see many of them carrying our flag in parades and participating in military funerals. They tell me the veteran's organizations need more veterans to help them with these duties now. This is due to the failing health and the deaths of most of the WWII veterans who have kept these organizations alive with their unswerving dedication and patriotism. Perhaps it's time we expressed appreciation with a card or a phone call to someone we know personally while there's still time. It shouldn't have to be Memorial Day or Veteran's Day for us to be appreciative toward all of our veterans no matter where they served. The point is that they served and gave of themselves that we might live in freedom.